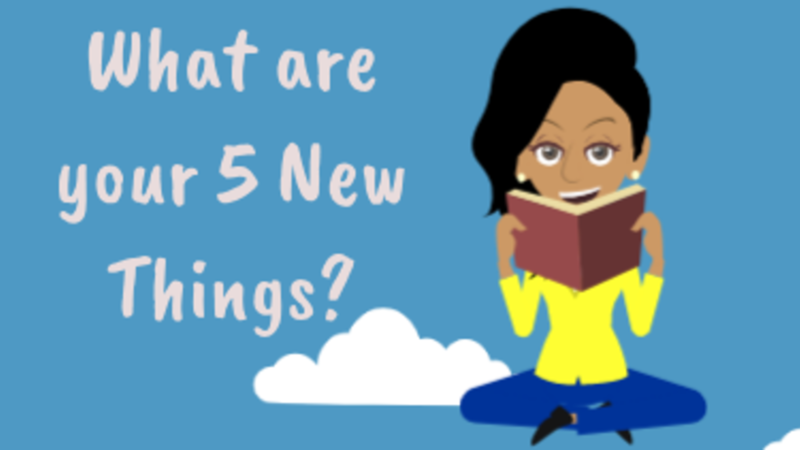 What are your five new things? It's 2019! Wow! It's another year! I am so excited because I am thinking about all of the AMAZING things that I want to do this year! Let's think of 5 things that we want to do this year! 1. I want to read 12 new books! That means I will read 1 book every month! 2. I want to write a story for kids! Do you want to write a book, too! Then, you will be an author! You can do it! 3. I want to learn to be a better swimmer! 4. I want to exercise every day! 5. I want to visit a new amazing place! How about you? What are 5 things that you want to try this year? Now that we've thought about our 5 things, we have to change one word. We should not say, "I want to"! We should say, "I will" because we WILL do it! Let's say our 5 things again, but this time we will use "I will!" I will read 12 new books! That means I will read 1 book every month! I will write a story for kids! Do you want to write a book, too! Then, you will be an author! You can do it! I will learn to be a better swimmer! I will exercise every day! I will visit a new amazing place! Great job!! I'm so excited about our new year! 2019 is going to be a year for GREAT THINGS!